I've tried to put it off until I knew Bella was ready. She is not one to be pushed into anything that girl. Asher was so easy, being the people pleaser he is, if he knew it made us happy he was all about it. As soon as he could understand what to do, we took him to Target, let him pick out big boy underwear and called it a day...potty trained by 2 1/2. Bella on the other hand? The girl is smart. She knows what to do and she knows we want her to do it. She doesn't care. She is going to do it when and IF she is ready...more like willing. I'm not one to push my kids to do anything, particularly Miss Priss, because I don't want her to run in the opposite direction. Cause she will. She's like her daddy. I can't pester Brandon to do something, I simply have to ask in the most loving, wifely way possible and then let him do it when he is ready. It's a testing of my patience. Daily. You couldn't find two more opposite people but gosh I love him. Back to the point...I would love to hear some tips or suggestions on successfully potty training a hard headed little girl. And when I say hard headed I mean that in the most positive way possible. When I was little, people used to tell me my mouth was going to get me in trouble (don't be shocked) but my mom always said it would instead be used for the Lord and His work. So, I am going to speak forth that this hard headed quality in my sweet angel girl, will be used for the Lord. One day. For now, it must be nurtured...channeled...conquered! Kidding. Well sort of. Let it be clear that I am not making her do it before she is ready. She is definitely ready. When she brings me a diaper and wipes and tells me she needs to be changed, she is ready. Now, not later whenever she chooses to give in. I refuse to have a 3 yr old still in diapers, simply due to a stubborn streak. Not gonna do it. My goal is to have her fully potty trained by November. Maybe this is a stretch, at minimum I would at least like to have her well on our way. 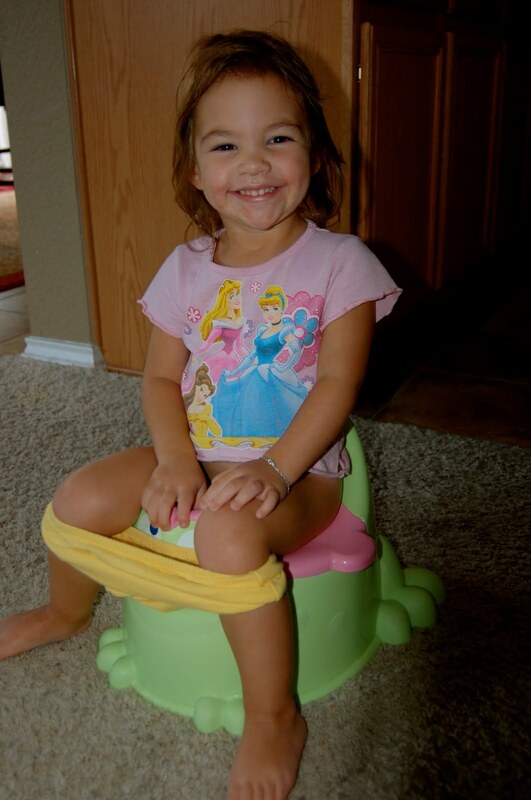 The other day, I sat with her for a good 10 minutes while she sat on her potty. We were having a fun 'ol time, talkin it up on everything from Abby Caddaby to the boo-boo on her knee. She had me take her picture, she hammed it up big time, thought she was hot stuff. After 10 minutes, I told her she could go play but if she needed to go potty come tell me right away. Two minutes...TWO minutes later, she comes downstairs with a big smile on her face and tells me she went potty. In Asher's room.